At a TiE conference that attracted some 4,000 top notch entrepreneurs, corporate heads, venture capitalists, the show stealer was a 13-year-old entrepreneur Anshul Samar who is the founder and CEO of his own company Elementeo. He talked animatedly about his product and his goal of hitting a million dollars in revenue before he heads to High School next year. For someone who has been splashed all over national and international media, he still remains delightful and hrefreshingly cool! Anshul decided 6th grade was a good enough place to start. 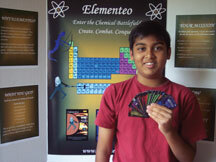 He pitched an idea to the California Association of the Gifted, competing with kids from all over the state. Two ideas were selected as the final winners and Anshul’s was one of them. “I got a $500 grant from CAG, and I consider that my pre-pre seed money for turning that idea into reality.” The product – a fantasy card game, where you beat your opponent by reducing his/her IQ to zero while learning about chemistry took flight. The weapons used are elements and compounds, which you mix and blend in secretive ways. The cards become toxic waste pile when you finally lose and you learn some interesting lessons in the process. Samar says it took almost a year of trial and error to arrive at the current game and the game will continue to recreate and innovate seamlessly to keep it exciting and fresh. Text books can often be boring, and Anshul wants to foray into other subjects too and create exciting ways of combining education with fun.